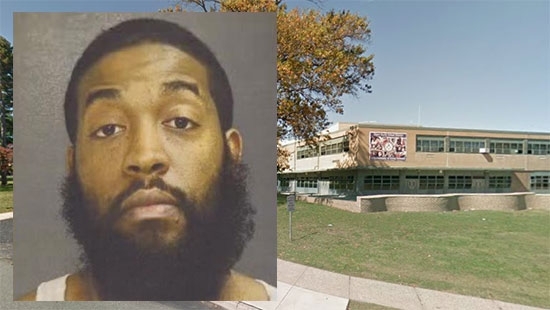 A student aide at Drexel Hill Middle School was arrested on Wednesday after police discovered a loaded gun and several rounds in his backpack. The school called police when a bullet was found in an employee restroom and turned in to school officials. The 32-year-old male aide came forward and claimed the bullet was his but initially denied having a weapon. However, a search of his bag turned up a loaded .40-caliber Glock and extra ammunition. He was taken into custody and will be charged with weapons possession on school property. His identify has not been released. The man is not an employee of the school district, he is an outside contractor hired to aid a special needs student. The school is located at 3001 State Road, Drexel Hill, Delaware County. UPDATE: He has been identified as 32-year-old Domonique Jordan of the 10000 block of Chelten Avenue in Philadelphia's West Oak Lane section. He is an employee of Staffing Plus of Haverford and had been assigned to a special needs student in 8th grade for the past six weeks. Jordan has a concealed carry weapons permit and an Act 235 permit, but is not permitted to carry on school property. The weapon was loaded with a 17-round clip. He also had two fully loaded 12-round clips. Upper Darby Police Superintendent Michael Chitwood said, "To go into a school with 1,200 1,300 kids and have a .40 Glock and 45-46 rounds of ammunition is absolutely insane." Police in Hatfield Township, Montgomery County are looking for a suspect who broke in a pizza shop early Tuesday morning and stole cash drawers and donation jars. It happened just before 6 a.m. at Hatfield Pizzeria on the 100 block of South Main Street. The suspect smashed through the glass front door and hopped over the counter. He stole two cash drawers and a donation jar from the counter. He then left through the same door. The incident was captured on surveillance video. If you have any information call police at 215-855-0903. Watch the video below. A North Philadelphia father has now been accused of killing his 3-month-old son. 3-month-old Javine Barratt was found unresponsive in a bedroom at home on the 2400 block of North 5th Street on Monday, March 20th around 11 a.m. He was given CPR by officers and taken to St. Christopher’s Hospital for Children. The boy died on Thursday, March 23 at 5:30 p.m. An autopsy showed that the infant had suffered head trauma. His father, 23-year-old Javine Barratt, was taken into custody yesterday. He is charged with murder and endangering the welfare of a child.